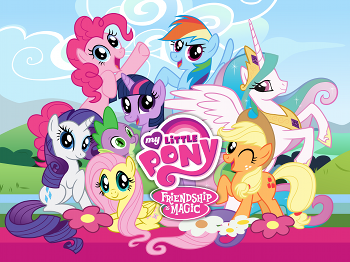 In an attempt to attract the attention of little girls across the nation, Hasbro Studios forged the My Little Pony entertainment franchise in 1981. With what began as a toy line of brightly colored ponies, each sporting their own distinct manes, the My Little Pony brand has changed and expanded multiple times since its inauguration. Yielding to popular demand, the franchise manufactured myriad merchandise, from books to children’s bedding. Hasbro diversified the franchise by producing My Little Pony television shows in 1994, 1992, and 2003. 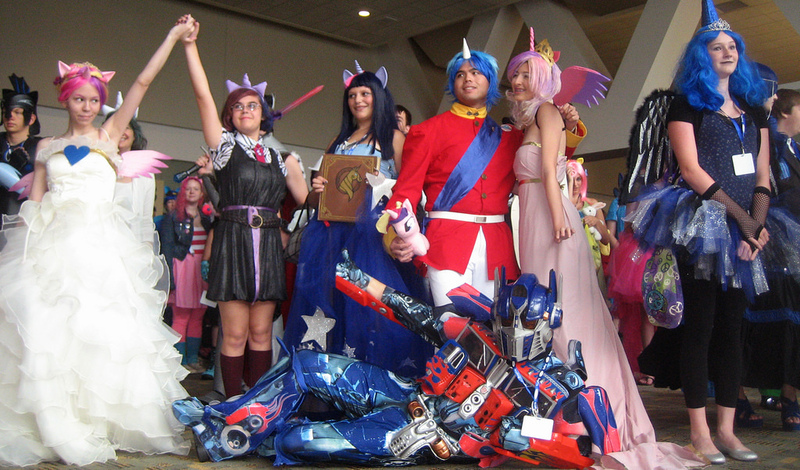 Soon after Hasbro released My Little Pony: Friendship is Magic, a surge of public interest took the internet by storm. Online sites such as 4chan became hosts for My Little Pony related memes, jokes, and general conversation. While some of these commenters were critics of the show, many were vehement supporters, or “Bronies” in the making. Described by some as among the most exponentially growing fanbases by 2012, Bronies have also gained a reputation for their utmost dedication to the subculture (Turner 2014). The subculture originally formed from the ironic notion of adults enthralled by a show tailor-made for young girls, but sprouted to include those with a more of a genuine sentiment towards My Little Pony. At the formation of the Brony Subculture, members were primarily educated men between the ages of 15 and 35 (Gilbert 2015). In addition to participating in the My Little Pony subculture via a number of avenues, Bronies also serve to advance My Little Pony: Friendship is Magic’s mantra of love and tolerance (Edwards & Redden 2012). Their welcoming philosophy of blind acceptance permits widespread communication, and acts as a driving force behind the entire Brony subculture. Indeed, many Bronies maintain that the Brony friendships they have made and preserved online are significant factors influencing their continued membership in the Brony fandom (Edwards & Redden 2012). The Brony fandom grew to encompass a sizable number of members with a wide geographic distribution worldwide. Consequently, Bronies created their own webpages, namely “Equestria Daily” and “Ponychan,” to allow and promote discussion between Bronies from all around the world. These sites gave Bronies a space to share fan art, fan fiction, music, and stories, all of which helped instill a sense of Brony community. Bronies have even developed their own jargon labeled “Bronyspeak” that they use to communicate with each other online (Roberston 2013). For example, “everypony,” is a substitute for “everybody,” “What the hay?” translates to “What the heck?” and “It’s time to pony up” means “It’s time to man up.” Countless other examples can be found online, especially as some fans have compiled commonly used Bronyspeak terms into informal dictionaries. Profuse knowledge and proper implementation of “Bronyspeak” now serves to expose Brony members as experienced or amateurish. authentic or inauthentic. Still, the Brony subculture knows no leader. Participants foster a shared identity, but are not placed into a hierarchy. Members are fully able to join and withdraw from the community as they please sans repercussions. As the Brony community grew, fan activities evolved. Bronies eventually hosted what would become an annual convention called “Bronycon” in 2011 that allows Bronies from all over the world to congregate in one location and participate in various activities. The convention typically involves a musical concert, fan presentations, video games, cosplay, and video productions (Lozano 2014). Today, Bronies often gather to watch episodes together, create fan fiction, or simply discuss their mutual affection for My Little Pony: Friendship is Magic and similar experiences owing to their common interest (Peck-Suzuki 2016). The Brony subculture is notable for its explosive early growth, its dependence on the internet for its formation and propagation, and the fact that it was accidentally spawned by an unexpected demographic. The notion that adult men are fans of a television show about cartoon ponies that was intended for young girls attracts scorn from many, but perhaps its defiance of stereotypes is part of the subculture’s appeal. As I will discuss further in an exploration of prominent themes, the Brony identity emphatically deviates from the norm, resisting dominant values of masculinity and establishing an alternative to the mainstream culture of patriarchy. Resists toxic masculinity by allowing its male members to perform their gender identities in blatantly deviant ways. For example, Bronies advocate for nonviolence, which is a gentler approach compared to the norm. 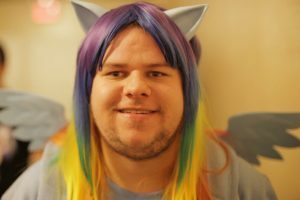 Additionally, it is not considered masculine for men to be so interested in cartoon ponies, but many Bronies embrace this aspect of their identities. By creating fan art and fan fiction, Bronies are not simply consumers of the My Little Pony franchise, but they are producers. Being that the creations made by Bronies are so vital to the subculture, I think it would be important to talk about. Adult men being so passionate about a TV show made for young girls can be made controversial enough by society, but another caveat has been introduced—the idea that Bronies sexualize My Little Pony. This has caused a divide between an otherwise unified subculture. Bronies participate in the commodification of My Little Pony merchandise. For example, attending BronyCon includes spending money on hotels, transportation, and costumes. Additionally, there are various different stations at BronyCon selling a variety of My little Pony products. Technology, especially the internet, allows the Brony Subculture to exist on a global scale. Bronies from all around the world interact to share their passion for My Little Pony. They exchange ideas, merchandise, and stories all regarding My Little Pony. 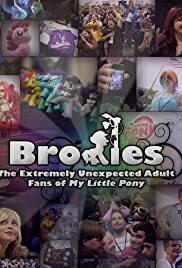 • The film shows a few different BronyCon conventions and explores the lives of different Bronies. It eons to Brony examines the pros and cons of Brony membership as detailed by real-life Bronies. • The film shows Ashleigh Ball (a voice actress from My Little Pony: Friendship is Magic) interviewing a diverse array of Bronies. Some interviewees include a former college athlete, a motorcyclist, and an army veteran. • While focusing on the history of Brony fandom, the film features interviews with notable Bronies with the hopes to shed positive light on the subculture. A short animated clip of ponies explaining what a “Brony” is and the overall Brony subculture. A song made by a Brony talking about Brony culture. Neighslayer, an instrumental brony band, performing at BronyCon in 2012. 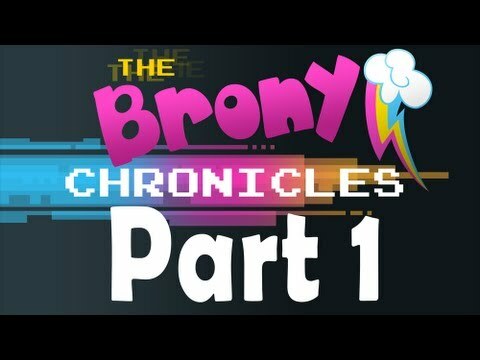 The first episode of “Brony Talk,” a YouTube show made by Bronies. A problematic FOX news clip in which the reporters attack Bronies, claiming that Bronies file disability so they can watch “My Little Pony” instead of going work. News clip about a 9 year old boy in North Carolina who was bullied for his “My Little Pony” backpack. The school banned the backpack instead of dealing with the bullies. • A “parent’s guide to Bronies” that is supposed to explain what bronies are to parents and how to identify if their child is a brony or not. Burdfield, Claire. 2015. “Finding Bronies-The Accidental Audience of My Little Pony: Friendship is Magic.” The Journal of Popular Television 3(1): 127-134. Jones, Bethan. 2015. “My Little Pony, Tolerance is Magic: Gender Policing and Brony Anti-Fandom.” The Journal of Popular Television 3(1): 119-225. Literat, Ioana. 2017. “The Power of a Pony: Youth Literacies, Participatory Culture, and Active Meaning Making.” Journal of Adolescent & Adult Literacy 61(1): 113-116. McCracken, Allison. 2015. “Fic: Why Fanfiction Is Taking Over the World by Anne Jamison (review).” Cinema Journal 54(3): 170-175. A blog written by a Brony entitled “A Day in the Life of a Brony” that examines the different obstacles most “out” Bronies face.